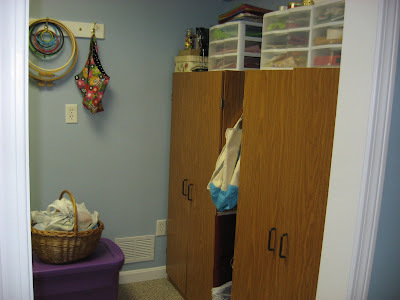 Hooked on Needles: Sewing Room Clean-up 2011 is Complete! Now imagine you just stepped into the door of my sewing room and looked a little to your left. This is what you'd see. There's my trusty old (and I mean OLD) Singer sewing machine with my handy dandy bulletin board above it and my nifty thread holder with overloaded wooden dowel for ribbon rolls. I hung another cafe curtain rod to display my siggy quilt, and I also hung up my snowman hardanger picture above the bulletin board. It's about time that snowman got a place of honor instead of hiding among the mess! 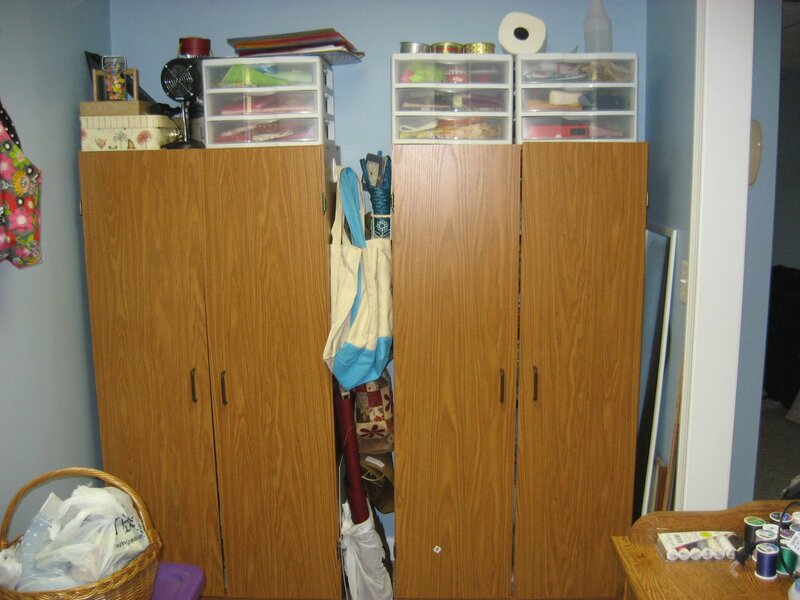 While still standing in the doorway, if you look just to the right, you'll see these two cabinets tucked neatly against the wall, with my bag stash peeking out from between them. I put some of those 3M sticky hanger things on the sides of the cabinets so I could hang up all the bags I use for all different things. Did I ever mention that I love bags? You can see one of my favorite bags hanging on the hooks against the wall. That one was a giveaway prize I won from Debi and it is so perfect for bringing along a project, so I keep that one easily accessible! Plus it's made out of such awesome fabric and I just like to look at it! On the floor there in the purple bucket is what's left of my yarn stash. After I finish the afghan I am working on right now, I plan to use up most of what's in there on a scrap afghan I started a while ago. I love making scrap afghans with leftovers! The basket on top of the purple bin is full of fabric panels and matching backing fabrics for some baby quilts and tree skirts and the like. Those are projects I work on in between big projects! If you step into my sewing room just a bit (which is all you can step in anyway because it's only 6 feet from the door to the opposite wall!) and turn to your left, you'll see this old dry sink which has been such a wonderful sturdy piece of furniture that we have used in all different places in our homes over the years. I was happy to finally see the top of it again! 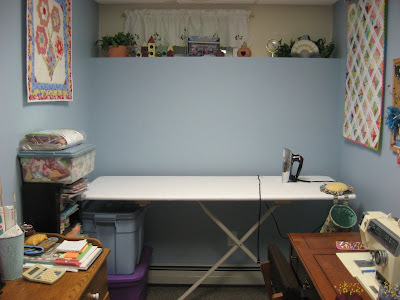 And this is the far left wall at the end of my sewing room that is now home to my new HUGE ironing board top which my husband gave me for my birthday! It is solid wood and covered in white cotton duck cloth. It was made by a husband and wife team from the next town from me and they delivered it to me personally! Now that's service! I love supporting local business people. 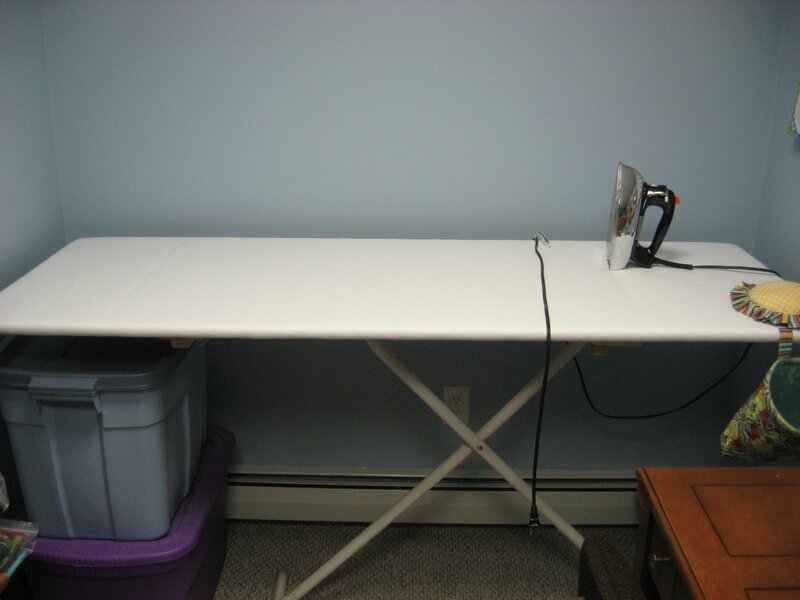 This new top is 5 1/2 feet wide and 2 feet deep, and it does not have that pointed end like a regular ironing board has, which is great for ironing clothing and curves, but for large pieces of quilting fabric, this new top will be a real dream! If you're interested in a top like this, I can share the contact information for the makers of it. Opposite the ironing board wall is the cabinet wall, and on top of the cabinets I put the 3-drawer units that hold my fat quarter stash, ribbons, leftover bindings, jumbo ric rac and other small stuff that would otherwise get lost. 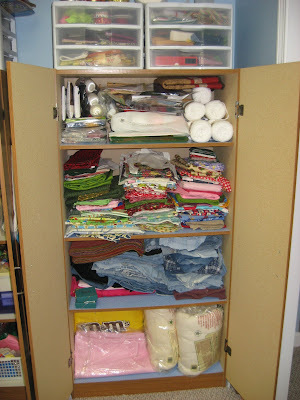 Inside the right cabinet, I have organized the top shelf to hold beading kits and other packaged projects that are waiting to be done. I also tucked my supply of white cotton yarn balls there which I still want to try dying with kool-aid someday! The second shelf is what's left of my fabric leftovers after destashing. A lot of this will be used to make aprons and other items with the denim that is on the third shelf. I have been collecting jeans that are no longer usable as clothing for years, but the collection was taking up so much space that I decided to cut it all down and keep just the usable parts of the jeans. So that is what I have left...no more thick waistbands or chunky pockets, just the flat parts of the legs to cut up and make useful things out of. And the bottom shelf holds some queen size battings that will be used in quilts I'll be making very soon, a nice piece of pink denim yardage, and my M&M bag full of all my beading supplies. 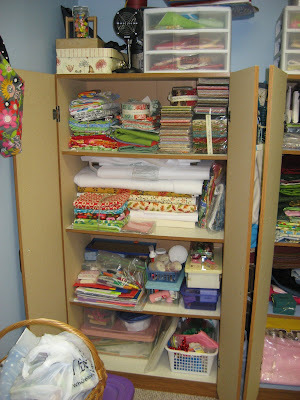 The left cabinet is now home to all my precuts and some yardage, both folded and still on bolts, and miscellaneous craft items on the two lower shelves, like scrap booking stuff and cross stitch and paints. 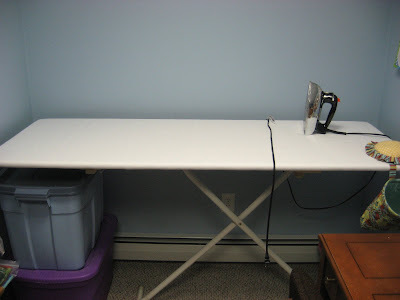 Now turn around and take one more look at this fabulous ironing board top! My iron looks so small on it! Now step just outside of my official sewing room (notice there is no swinging door but instead a pocket door because I did not want one inch of my small space wasted!) and you will see the ping pong table, which hasn't actually seen a ping pong ball or paddle in years! 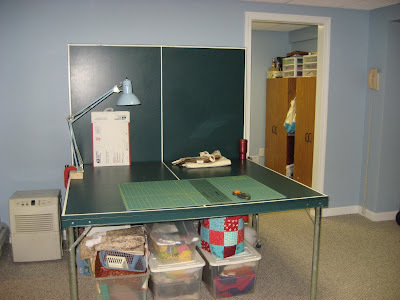 It is my cutting table, and I just love it! When I am working on a really big project, I pull it out and lower the other half so I have a super huge flat surface to work on. It's nice to finally see the whole thing again...the 'before' pictures would have been much too embarrassing to show! My next quilt project is sitting there just waiting to be started. Underneath the table are all the items I have listed in my Etsy shop for sale, packed away safely and out of the way. And that box at the back of the table? 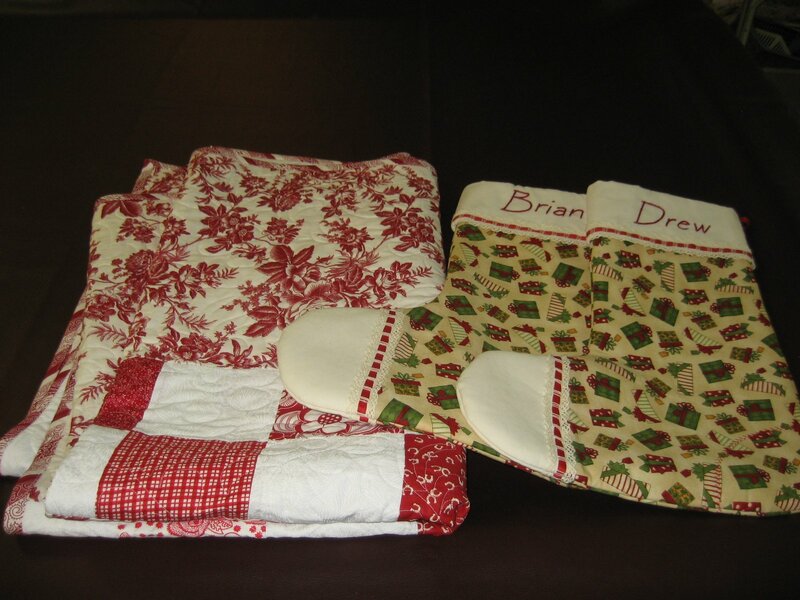 That's what the winner of the Fabric Scraps Giveaway will be getting in the mail! It is STUFFED full...but I'll tape it well! These boxes are all my destashed fabric and yarn that have been listed on Etsy and numbered so I can keep them straight. And there are some rolls of upholstery fabric that I will be bringing to my sister soon. These are finished items waiting to be delivered. 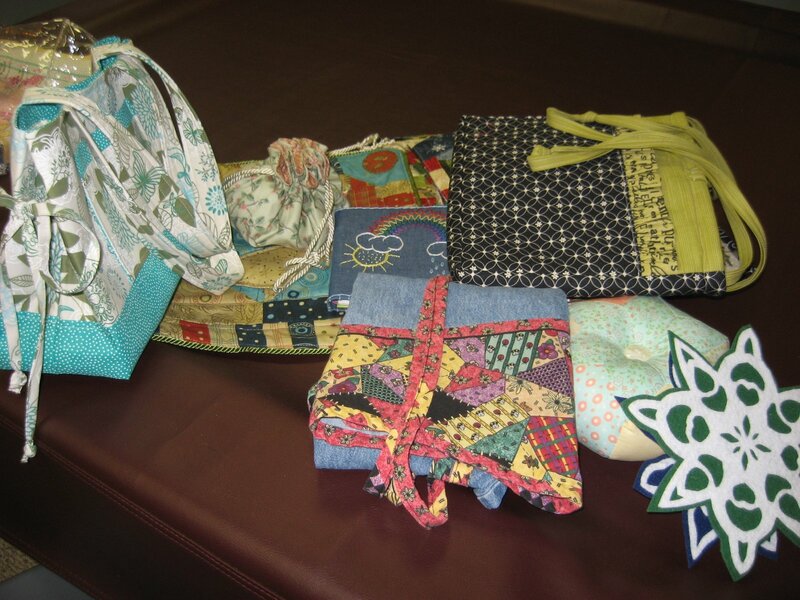 And these items are things I've made or purchased that I need to move along for other people to enjoy. I may be doing a few more giveaways so be on the lookout! And that's it for my tour. 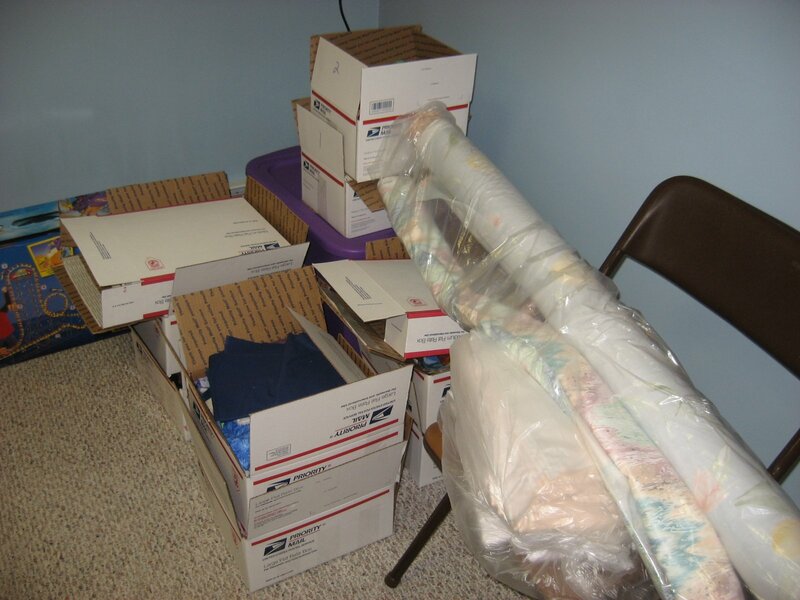 If you've made it this far, you probably want to know who will be getting that box of fabric scraps. So let's take care of that right now...give me a minute to write down all the names...ok, now I have to go back to my husband's office and have him pick one out of the hat since my two giveaway helpers are in school right now...and now I'm back with a winner...is it YOU? If you are Beth McDonald, then it IS you! Congratulations, Beth! I'll email you for your address! Thanks to all who entered and were willing to help me destash! I truly appreciate it! Now it's time for me to get down to that clean sewing room and make a mess! Wow! You're like the white tornado! Everything looks great Mary Grace...do you have time to come down to Ohio and help me now? LOL! Oh WOW is all I can say! Great room and brilliant ironing board! Great job on the clean up! Congrats to the winner. What a wonderful space you have and that ironing board is to die for - how perfect. Congrats to Beth! Great use of a small space, and the ironing board is super! Congratulations to Beth. 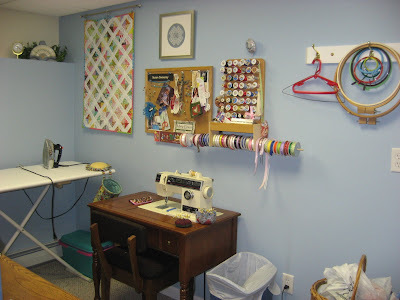 Your sewing room looks fantastic. Marvellous, congratulations! I´d give everything away to be so organized as you are!! You inspired me every time, and I thank you for that. I don´t dare to photograph my place, you would not believe the mess! But I know this is fundamental to be able to work, design and progress, particularly to those who love weaving so muchas as sewing. Again, thank you very much!. Many greetings from the southern spring here in Buenos Aires, Gabriela. Your re-organized sewing room looks great. How wonderful that you have such a large ironing board. And it must be so great having the ping pong table to use as a cutting surface. 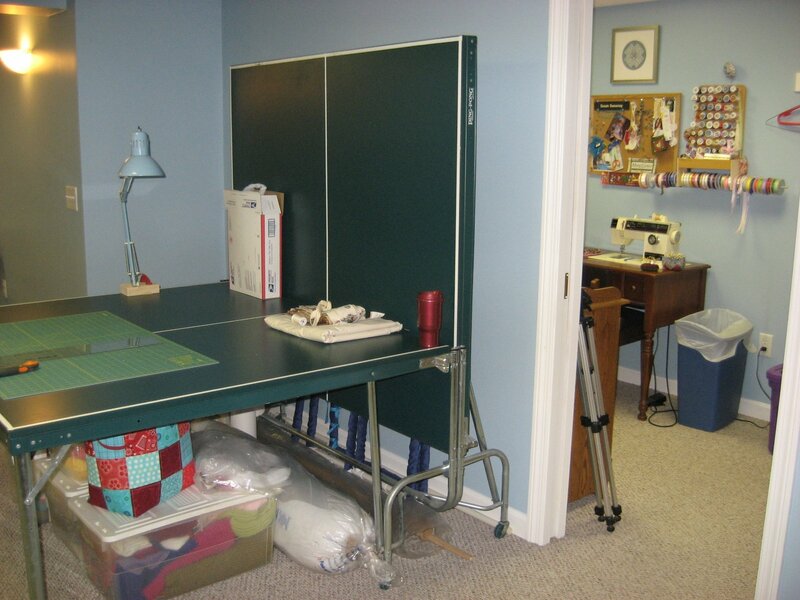 I am so excited about your new sewing room! That ironing board! The organized cabinets! 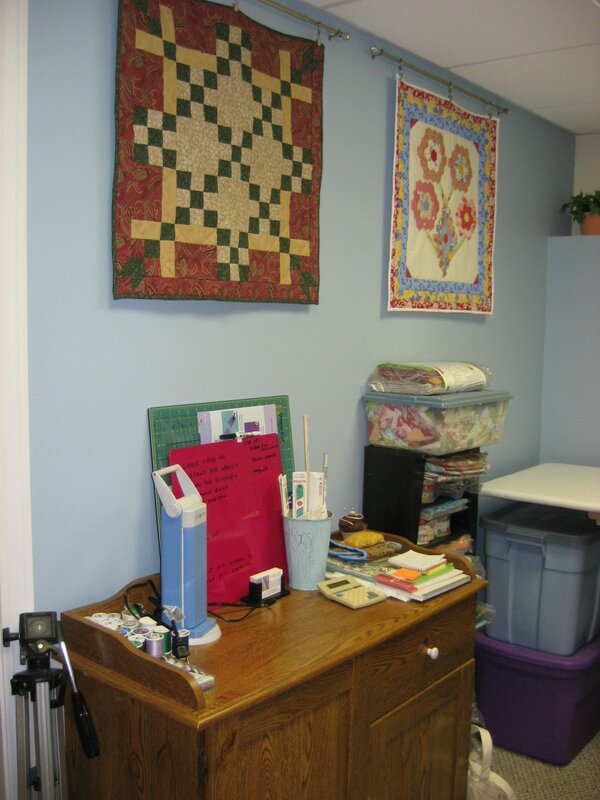 The quilts on the wall! 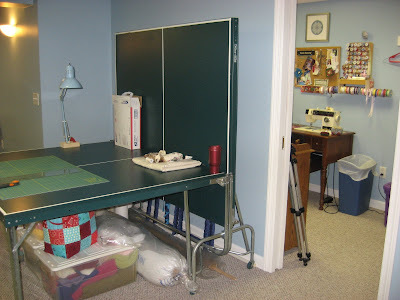 The old sewing machine (mine is old too, they don't make them like that any more :) And then that ping pong table?!?! Lucky lady! Thanks so much for sharing with us! What a great use of a small space! My sewing room is small and always looks like a tornado hit it...I intend to organize it and clean it up, but would rather be sewing! I love the idea of using a ping-pong table as a cutting table! Genius!!! Over whelmed in Texas. Want to come help me finalize my organization. ugggh! We just moved and my room is smaller so I'm trying to figure out how to fit every thing but it's getting there.